Even before Do Space opened, Stavick knew she wanted to establish a fellowship for talented Omahans to use the library’s tools and resources. The Do Space Innovation Fellowship launched in spring 2017 with three Fellows: each received $10,000 to generate innovative projects in software, 3-D printing, or robotics over the course of eight weeks. “It was very important to us that we focused this program on local teachers and educators, because we knew that they would carry on what they learned in their classrooms,” Stavick says. Math teacher Charlie Cuddy developed an online platform to help people learn to code with Bricklayer, while science teacher Derek Babb created an online resource for teachers focused on cybersecurity. 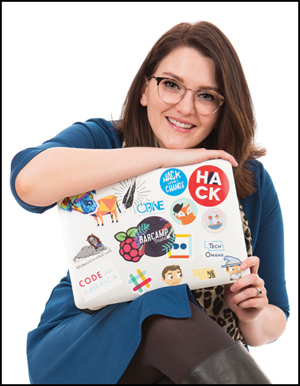 And Kylie Gumpert, a growth engineer at the nonprofit DIBS for Kids, created BookZeal.org, which connects donors with teachers and libraries in need of books. “Rebecca understands the critical importance of individuals having access to technology so that they can further their education [and] workforce skills and fully participate in the knowledge economy,” says Susan Benton, president/CEO of the Urban Libraries Council. (Stavick sits on its executive board.) “She sees opportunities and strategically moves forward to the benefit of Omaha and its citizens.